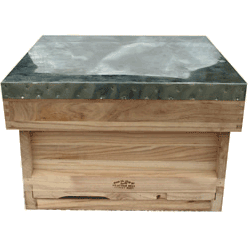 British National Bee Hive with a Standard Deep Box. 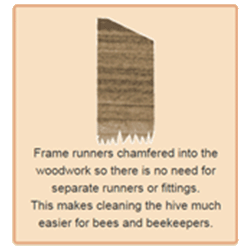 This is the most commonly used bee hive in the UK, an ideal starter hive. This is fully assembled, no DIY needed. Roof, Metal clad, 4 inches deep with two top vents. Varroa Mesh Floor including 3 way entrance block and sliding inspection tray. This can be supplied filled with 11 Hoffman self spacing brood frames fitted with wired wax foundation and 1 Dummy Board .